According to local legend pilgrims travelling from India in search of Shiva’s son, Lord Kataragama, believed Ulpotha was a sacred site associated with the deity. 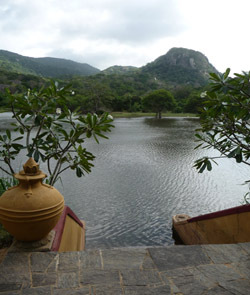 The land is also believed to be the playground of Prince Saliya – the son of Sri Lanka’s most legendary king, Dutugamuna, who united the country during his reign (161-137 BC). According to the myth, the Prince escaped the ancient city of Anuradhapura with his outcaste gypsy wife, Asokamala who was described in ancient texts as a rare beauty in the ‘realm of the divine’. Through a secret tunnel, they came to live in a cave above the lake at Ulpotha. I’m fortunate enough to be at Ulpotha during one of the owners’ frequent visits to the retreat. A former investment banker-turned-‘accidental businessman’, Viren Perera, exudes a relaxed playfulness and the fascinating charisma of someone who knows they have a blessed life. Despite the fact he says it’s the land that makes Ulpotha special its obvious that a big part of the retreat’s success is his own magic. As the new guardians of the land, Viren and Tennekoon set about restoring the main house (‘Walauwwa’) and started a village that embraced indigenous farming practices. Tilled by human hand and threshed by buffalo, thousands of trees were planted and diverse crops cultivated using organic faming practices that follow the lunar cycle. One serendipitous moment led to another and Viren and Tennekoon met Englishman, Giles Scott. According to Viren it took Giles’ involvement for “a more practical turn” in direction to come to Ulpotha. Giles introduced yoga as a bridge to the West, which now subsidises the village and attracts paying guests for six months of the year. The rest of the year it is for what Viren says it was meant to be – nothing. Our daily program consists of morning and afternoon yoga, pranayama and meditation sessions complemented by Ayrurvedic treatments and being pampered Ulpotha’s visiting massage therapists, including Australian Kahuna and Reiki practitioner, Erin Kostanski. After dark we gather in the ‘Ambalama’ (communal area) to tell our stories. It soon becomes obvious that the very things that might frighten off some people – no electricity, yoga and meditation, cold showers, vegetarian meals and being ‘at one with nature’ – are the very things that attract those who come here. “Decide where to place your mind,” she instructs as she leads us into our meditation practice. It comes easily here. The days are listless and time moves slowly so the mind starts to goes with it. I sign up for a seven-day plan of ‘preparatory and elimination therapies’ that are steps along the path to Panchakarma (Ayruvedic detoxification). On my first visit, Dr Srilal takes my pulse and asks me a series of questions about my eating, sleeping and bodily functions in order to determine my ‘dosha’ (constitution). Dr Srilal prescribes a series of daily treatments including full-body massages, facials, steams and herbal baths. I’m scrubbed with Indian gooseberry paste, turmeric and smothered in sesame oil, honey and milk until I have the tell tale euphoric glow, red-stained feet and armpits that come with visits to the Wedegaedara. Based on Ayruvedic principles of balancing Vatta (air), Pitta (fire) and Kapha (water) our meals include the six tastes of sweet, sour, salty, bitter, pungent and astringent. With fresh produce plucked from the kitchen garden and cooked in terracotta pots on open fires, there’s an earthy wholesomeness about the menu. Curries, rice, vegetables and fruit are the daily staple and on ‘hopper night’ we party on Sri Lankan-style pancakes and the local brew, Arak. Frolicking on the lake with newfound friends one day, I recall Viren describing his relationship with Tennekoon and Giles. “Our connection was just about having fun and everything we did was just like playing,” he said. His words evoke a sense of the carefree delight of childhood and it dawns on me that this place is like Never Never Land for grown ups. Ulpotha welcomes guests for only 30 weeks of the year from June to August and November to April. Bookings are from Sunday to Sunday and the all-inclusive package includes accommodation, meals, yoga classes and one free massage. Additional Ayurvedic five to 28-day programs are available at an additional cost. For dates and pricing details visit www.ulpotha.com. Bookings: www.ulpotha.com or via Ulpotha’s Australian agent Maria Chanmugam on maria@ulpotha.com or 0406 595033. Getting there: Ulpotha will organise a driver for the three-hour journey from Colombo Airport to the retreat for LKR9,000 each way. Visas: A 30-day visitor visa can be obtained at www.eta-sri-lanka-visa-support-au.com. What to bring: You don’t need much but in addition to the list Ulpotha sends you, its worth bringing a good headlamp or backlit e-reader for reading at night, a pedicure set and good quality shampoo and conditioner. * This article was first published in Australian Yoga Journal.